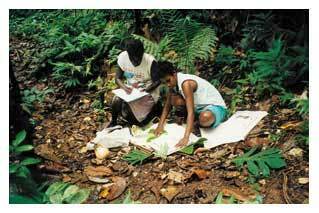 Documentation of the bush food resource of the Babatana language region of Choiseul island. Bushfood specimens were collected in the rainforest and pressed between layers of newspaper to preserve them. Total project funding – $19 890. The purpose of documenting the traditional knowledge of the Babatana-language group was to promote the use of bush foods harvested from the forest to supplement vegetable production in home and bush gardens. The Babatana language group occupies part of the island of Choiseul – the traditional name for which is Lauru – however the bush food surveyed is found throughout Choiseul. The ethnobotanical manual, produced in both Babatana and English and illustrated with photographs and drawings, is designed to be used by village communities and schools. Motivation to document the wild harvest was stimulated by the rising popularity of imported foods. This is leading to a decline in the use of bush foods. As traditional bush foods are forgotten so is the information about their preparation and use. It is mainly older members of the communities who now retain that knowledge. To assess the cultivation potential of bush foods, trial plantings of selected species were made in the Lauru Kastom Garden Program’s food garden at Sasamunga Hospital. The participation of community members who retain a knowledge of bush foods proved critical. Under their guidance, specimens were collected in the rainforests covering the steep ridges and brought back to the village where they were identified. Workshops were organised where the preparation and cooking of the collected plants was demonstrated and documented. Classes in local schools made leaf rubbings of specimens to assist identification and to promote the value of the resource. The project’s partnership with the Solomon Islands National Herbarium allowed botanist Myknee Sirikolo to provide botanical names for the collected species. For Myknee, the project was of special significance because Choiseul is his home island. The manual is to be distributed to communities where it will provide a permanent record of their bush food heritage. Child with edible fern collected from the rainforest. Children participated in the ethnobotanical manual project. Bushfood collection and identification were at the core of the project.